On April 30, the Yankees celebrate the anniversary of their first home game in the city of New York. Since that debut in 1903, the Yankees have inarguably become the most dominant, powerful franchise in all of American sports. So, it’s hard to fathom that this mighty franchise was once an orphan ballclub, rendered homeless and nameless by the corrupt and cut throat politics of the city it hoped to win over. From the onset, American League founder Ban Johnson had his eyes on New York. For the first two years of its existence, the Yankees actually resided in Baltimore as the Orioles. The team was part of the newly created American League, established by lifelong baseball-man Byron Bancroft “Ban” Johnson as an alternative to the long-established National League. In its first two seasons, the new league enjoyed many successes. It was able to lure significant top talent from the National League, which had imposed a salary cap on individual players, and achieved instant profitability. However, there was one area in which the league was not successful: it could not place a team in New York. Johnson knew that in order for the American League to truly stand on equal footing, it must have a team in New York. Easier said than done. At the time, New York was run by a Tammany Hall, a political organization that gave new meaning to corruption. Tammany controlled everything in New York: real estate, finance, labor, prostitution, gambling…and, yes, baseball. Unfortunately for Johnson, Andrew Freedman, the owner of the National League’s New York Giants and one of the city’s wealthiest men, was a long standing Tammany man. New York City Police Chief “Big” Bill Devery assumed co-ownership of the new American League team. Andrew Freedman had tried to stop Johnson from creating a new baseball league, but failed. He then tried to organize the National League owners in order to prevent the AL’s raid on its players. Freedman failed again. Finally, he conspired with former Baltimore Orioles player/manager/owner John McGraw to sabotage that franchise, but even this nefarious plan fell by the wayside. 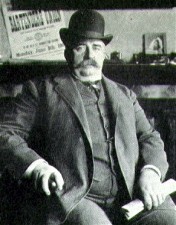 Then, in December 1902, Johnson was able to negotiate a peace settlement with the National League that granted him a concession to move the Orioles to New York. What’s more, Freedman exited baseball by selling his share of the Giants to John T. Brush. Finally, it looked like Johnson had won out over Freedman. Or so it seemed. Freedman may have been out of the picture, but he was still pulling strings behind the scenes. Even though he could not thwart Johnson’s ability to establish the American League, he could damn well keep him out of New York. With the help of his Tammany buddies, Freedman locked up every parcel of real estate from 155th Street down that was sufficient for a ballpark. The political wrangling left the Orioles without a place to play, rendering Johnson’s hard fought concession from the National League worthless. For months, Johnson scrambled to find the Orioles a new home in New York. Every time he thought a location had been secured, Freedman blocked his path. The search went on for months, but in the meantime, Johnson stocked the New York Americans, as they were being called, with stars like Clark Griffith, Wee Willie Keeler, Jack Chesbro and Jess Tannehill. 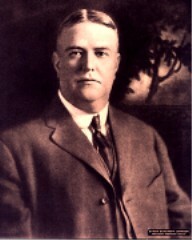 Pool King Frank Farrell controlled a gambling syndicate before taking co-ownership of the Yankees. By the time Johnson’s orphans assembled in Atlanta, Georgia for Spring Training, the team still did not have home. Grumblings from the players began to emerge, including requests for contractual release. Faced with this mounting pressure, Johnson was forced to cave into a rival Tammany syndicate that was pushing a rocky plot of land located way uptown in Washington Heights. Around the clock construction was needed to clear the rocky land that would be the home of the new ballpark. While that was going on, two men would secretly emerge as the co-owners of the new franchise: Big Bill Devery, the former police chief of New York City before being removed from office by the legislature, and pool room king Frank Farrell. Both Devery and Farrell were heavily involved in Tammany’s activities and had garnered reputations that would make any hustler blush. Now, with American League baseball about to debut in New York, the pair had pulled off the ultimate coup. Even as the start of the season neared, last ditch attempts by Freedman to thwart the final stages of ballpark construction fell by the wayside. Still without a formal nickname, New York’s American League team (alternately called Hilltoppers, Highlanders, Americans, Invaders, Kilties, Greater New Yorks, etc.) opened the season in Washington against the Senators and then headed to Philadelphia for a series against the Athletics. Meanwhile, the finishing touches of American League Park, as it was creatively called at first, were still be putting into place. A view from outside Hilltop Park, circa 1904. The new ballpark was not exactly the palace that Ban Johnson had first envisioned. In fact, it really wasn’t fit for any major league team, much less one that played in New York. 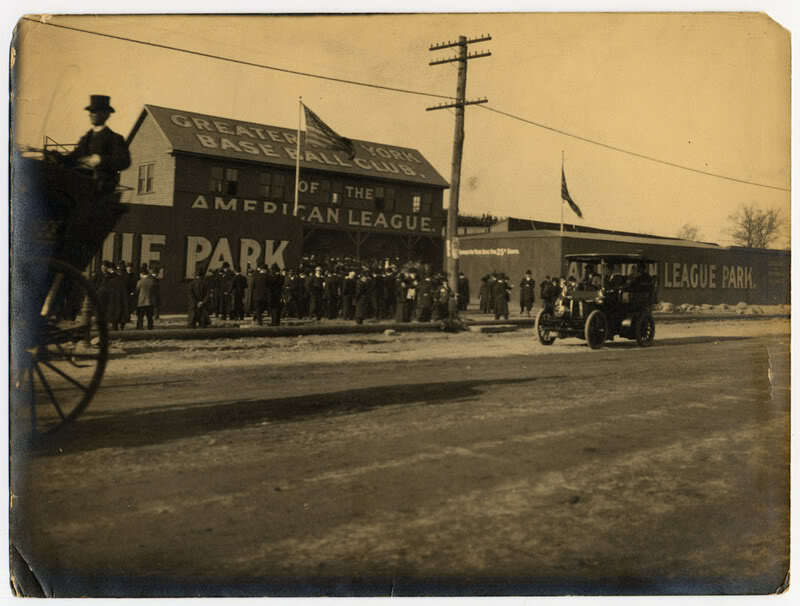 Although the hastily constructed wooden grandstand and bleachers were not completed, the capacity of the ballpark, including outfield standing room, was expected to top 30,000, but really accomodated much less. Although comfort and amenities were non existent, the conditions in the stands were actually much better than on the field. Only the infield was covered in grass, while the occasional rock or stone dotted the otherwise barren outfield, which was cordoned off by a rope instead of a wall. In right field, the remains of a pond created a gulch into which any batted ball was ruled a double. This “charming” feature of the ballpark soon became known as Keeler’s Hollow after the team’s right fielder. Various players warm-up before the first game at American League Park. Ready or not, the American League’s New York aspirations were finally a reality. On Opening Day, Devery and Farrell, finally outed as the team’s owners, sat proudly with Ban Johnson amid a sea of politicians as marching bands announced the presence of both teams. In front of over 16,000 fans, the Greater New York Club, as they were called in the Times that day (click here to access the article from May 1, 1903), jumped out to an early 2-0 lead with single runs in the first two frames. The fabled Keeler recorded the team’s first hit and scored its first run in New York, when he crossed the plate on a double hit “over the left field ropes” by second baseman Jimmy Williams. The New York Club eventually jumped out to a 6-0 lead and cruised to an easy 6-2 victory behind Jack Chesbro, who was “in great form”. 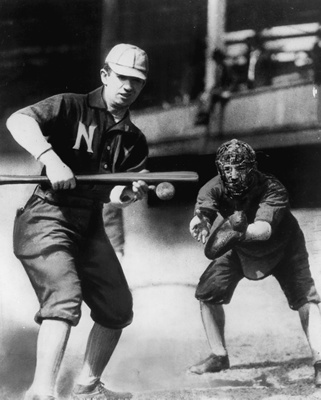 “Wee” Willie Keeler was the new team’s most heralded player. All things considered, the American League’s debut in New York was a success. And, making it even sweeter, the National League Giants lost 10-2. After a decent start, the Greater New Yorks started to fade from the pennant race, despite attempts by Johnson to stock the club with reinforcements. By June, the enthusiasm for the new club was waning, and the attention of the city shifted back almost entirely toward the more established, and better, Giants. At year’s end, the Giants’ attendance, which led the National League, more than tripled the 200,000 fans who passed through the turnstiles of American League Park. Still, the American League had survived a season in New York. Ban Johnson’s invasion finally had a beachhead and there was no turning it back. The ensuing years would be difficult, but the team’s slow emergence would eventually combine with the one-man phenomenon of Babe Ruth to create an unimaginable power house that would dominate the baseball world, not to mention New York City.